She rolls her eyes when I say this, but she really makes the best bed ever. Ever. She’s got a heart of gold and a laugh that will make you want to join in immediately. And she is an unbelievable hostess–in my completely unbiased opinion she rivals Ms. Stewart. Yesterday we spoiled her a bit with a big bouquet of peonies, a fancy juicer and a pretty gold bracelet. I hope she knows how loved she is. Wishing you a lovely day of sunshine and prosecco. May there be gorgeous blooms, delicious hors d’oeuvres and an early bedtime. And if its not too much to ask, a few tight-squeeze hugs too. You are always doing (and doing) for others so I hope you’ll let Dad and I step in today. 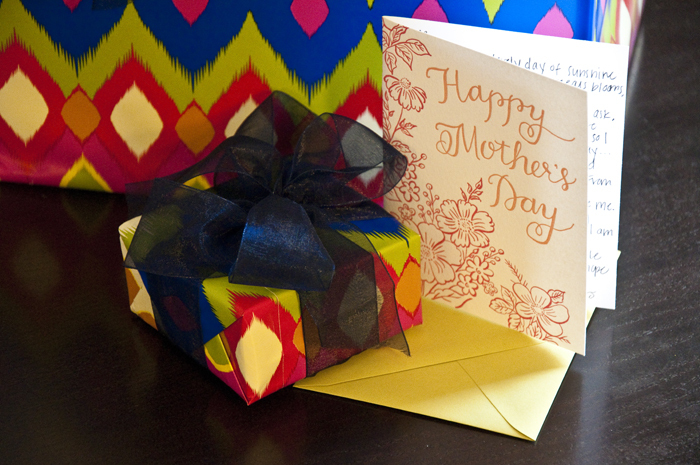 You are the best mother a girl could ask, wish, hope for–inside and out. From Brownie troop leader to wedding ambassador, you’re always right beside me. Your encouragement and unfailing support have made me the woman I am today. Thank you for being such a wonderful friend and incredible role model. I love you so much Mom and hope you know it everyday.